I'm guilty of "over maintaining" my motorcycles in some respects, but chains ain't one of them. Some folks have a regimented chain program of cleaning ("must use a size 00 camelhair brush and XYZosene") and lubing ("every 300 miles, bottom run only!") and no online forum is complete without a debate concerning auto-oilers and the best chain lube: 90 wt. gear oil, WD-40, purpose-made lube, nothing at all, etc. Maybe I've got a super-light throttle hand, but I historically get a minimum of 20K miles on a modern, O- or X-ring drivechain with very little time, effort and worry. A couple of months ago I replaced the original chain on my ZR-7S at 25,366 miles because it was worn unevenly (unavoidably caused by power pulses) to the point that it was affecting driveability; however, it wasn't excessively worn -- I had plenty of remaining adjustment range per the swingarm marks and could only pull the chain away from the rear sprocket a tiny bit. And to some folks' horror, I reused my sprockets; I was surpised by that as well, but I compared the new ones I had on hand to the old ones and there was no discernible difference. My chain maintenance regimen? 1) Manually squirt or drip some lube "every so often" or when the chain looks a little dry, on the top run ('cuz it's easier to get to); and, 2) oh yeah, that's it. Cleaning? Puh-leeze. I bought a Grunge Brush in my garage some years ago and it's still in its original packaging. Devoting brain cells to deciding what lube to use? Sorry, can't spare 'em (whatever is on the shelf will do, duPont Teflon of late). 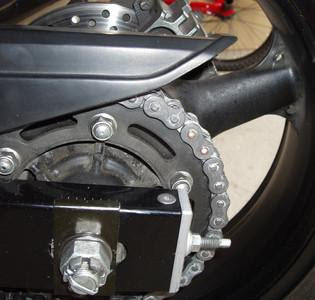 I think the biggest factor in chain/sprocket wear is proper adjustment. Judging from the chains I see on many bikes, many if not most folks keep them way too tight, which accelerates wear on both chain and sprockets. I keep my chains within factory specs, which would appear to be too loose to some folks, using the factory-recommended method (on my ZR, as with many bikes, that means on the centerstand, measured mid-way on the bottom run with the chain at its tightest point). BTW, RK makes this nifty tool I used to break my old chain and rivet the master link on my new EK X-ring chain.